Today was my last day with my 2003 Centenary Edition Harley-Davidson Heritage Softail Classic. I am very sad to see it go as I feel it was part of me for the past 13.5 years. 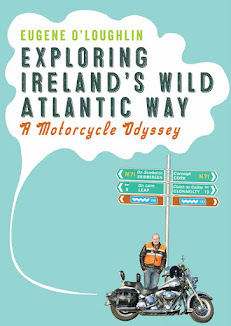 In 59,776 miles (95,640 kms), I have ridden this bike as far as Faro in Portugal, been through Spain twice, holidayed in France, crossed Britain, went to work almost every day on it, and of course travelled right around the coast roads of Ireland including all of the Wild Atlantic Way, the Causeway Coastal Route, and the Mourne Coastal Route. It has appeared on two book covers, plus it features a lot in photos throughout my books. Despite my strong attachment to this bike, it is expensive to repair. There are a few items that need to be done to it to keep it going. The engine is in perfect condition, but brakes, brake disks, and tyres are due to be replaced soon. Rust is also a problem - not yet serious, but needs to be tackled. Rather than spend more money on it I have decided to trade it in for a Road King and continue riding on a newer bike. One of my favourite photos of my bike is the one below taken on the Atlantic Drive in Achill Island, Co Mayo. The saddle bags and windscreen were taken off for this trip on our Summer Holidays in 2007 - it was at its shiniest best in those days. So long my good companion.